When I was a child there were not many choices available to my parents when it came to my education. There was a Catholic private school in town, but my parents never thought about sending me there. Instead they sent me to public school just as their parents sent them. And there was no hesitation or debate about whether this was a good match. They did not have much say in the matter and that was that. These days parents have so many choices in regards to just about everything, and though this can feel overwhelming at times, in the area of education it is a blessing. Children and teens have such unique needs that finding the best environment to meet their needs is half the battle when it comes to their education. And this is especially true when you are thinking about your twice-exceptional child. Because these kids have struggles and disabilities, they need to be in an environment that is equipped to deal with these issues. And because they are also gifted, these students need to be in an environment that will allow their passions and talents to soar. When it came time for me to start thinking about my own children and their education I knew I wanted something different for them than what I had. I struggled in school. I had anxiety and some learning challenges that were never addressed while at the same time I felt bored over and over again with what we were learning. My education left much to be desired and I did not want my kids to have those same feelings. I am lucky that I discovered homeschooling before the kids started school. When I first heard about homeschooling I had no idea what exactly it would entail or if it was something I could do, but I knew I wanted to try. This was at a time when the internet was just starting to take off, so I was able to find the resources I needed while also connecting with other homeschooling parents. This was 18 years ago and though there were not as many resources available as there are today I knew this was the right choice for my kids. They soared with homeschooling and had such a joy for learning that I never had. It was wonderful to see. 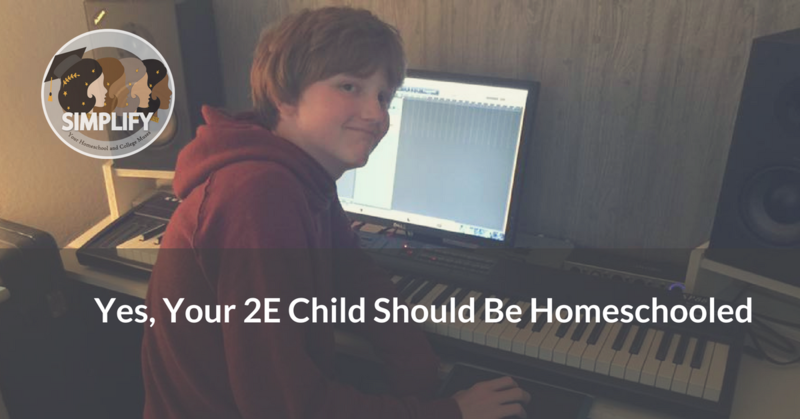 If you are struggling with finding a good choice for your 2E student you should consider homeschooling. There are numerous reasons this path is a solid choice for your child, and I want to take a moment to go over them in case it may help someone considering this option. No one knows your child as well as you do. You have been raising them from day one and by know you know their strengths and weaknesses. This knowledge will help you every step of the way in their education. One-on-one instruction. Gifted and twice-exceptional children work best one-on-one and in a homeschool environment this is possible. Even if you are homeschooling more than one child you will have time every day to work individually with each child. If you have a house full of young children, as I once did, you may not have a great deal of time to devote to each child, but even little moments of one-on-one time throughout the day go a long way. Less time needed for actual seat work, more time for passions and therapies – At a traditional school, much time is wasted throughout the day because there are so many children in a class. At home, actual school work can get finished quite quickly especially while your children are on the younger side. This leaves more time for a child to explore their passions, whatever they be. It also allows for you to schedule in any therapies that may be needed. Homeschooling choices abound! – Just as you chose to homeschool, you also get to choose your method of homeschooling. There are so many methods, from unschooling to classical schooling and everything in between, have both positives and negatives. With homeschooling you can try each method out until you find the one that is right for your child and yourself. In school the child must conform to whatever approach the school takes. At home this is not the case. If you don’t know what approach might be best for you, here is a quiz you can take. Curriculum choices – Just as there are choices in homeschooling approaches, there are choices in the curriculum you use (if you choose to use a curriculum). When I first started out there were not as many choices. But today, with the explosion of the homeschool market, there is so much out there. If you decide on a math curriculum and your child struggles with it, do more research and pick up a different program. This is a great benefit to the 2E learner as often one curriculum may not work but another does. If you don’t know where to start, the Well Trained Mind forums are a wonderful place to get information on all that is out there. One word of caution – Sometimes as homeschooling parents we are tempted to hop from curriculum to curriculum trying to find that perfect match for our child. There is no perfect option and jumping around too much can have a negative impact on your child’s schooling. If you find something that is working fairly well my advice is to stick with it. Pacing, it’s your call – In homeschooling there is no set timeframe for work to be completed, and this is great for 2E kids. If your student understands and is excited by a topic they can work through it as fast as they want so as not to become bored. On the flip side, if your student is struggling with a concept or subject they can spend as much time as needed on that topic. For instance my youngest son is very asynchronous in his schooling. For language arts, he needs something that is at a high level and that is engaging. With math, on the other hand, he struggles greatly. We have been working through pre-algebra for a long time. Seriously, it’s been almost two years. And at times, as a parent and educator, this has been frustrating, but at the same time it is what he needs. By putting on the brakes and pausing for a review, he has not felt like he is a failure (which I am sure he would have felt in a traditional school setting) and he has been given the time to understand what he needs to know. Recently he has made big leaps and I can see he will be ready for algebra in the fall. I am thankful that I have been able to set the pace in his schooling. It has been one of the biggest benefits for my asynchronous learner. Cheaper than private school – Homeschooling is a wonderful model for asynchronous learners and although a private school may be able to provide a solid education to these students, homeschooling is much more affordable. This is a real benefit to those who are on a tight budget. You truly do not need to spend thousands of dollars on your child’s education to get results. Bully-free environment – Homeschooling is a more peaceful environment for most students and this is especially true for students with disabilities. In a homeschool setting the child can make mistakes without fear of ridicule. And they can be who they are, whoever that is, without worrying about fellow students. Proven record – Homeschooling works. It has been around long enough that we can see the benefits. Homeschool kids are engaged, both in their school work and often in their communities. They are self-starters and out-of-the-box thinkers. Homeschoolers are sought after by colleges and often thrive when they get there. If you have the time to devote to homeschooling you will see results. So if your 2E child is struggling in a traditional school setting and you are researching choices, I would highly suggest that you consider homeschooling. Likewise, if you have young children and are just beginning to think about their schooling, I would also recommend homeschooling. It is a solid choice for many and one that should be considered by all parents of twice-exceptional kids.Looking for support to get started on your homeschool journey? If so Simplify would love to partner with you as you begin this adventure!